April Bloomfield has spent most of her life in the kitchen and had the pleasure of working with some of the most revolutionary chefs before taking on a kitchen of her own. A native of Birmingham, England, April began her culinary studies at Birmingham College. From there, she went on to hone her craft through cook positions in various kitchens throughout London and Northern Ireland, including Kensington Place and Bibendum. It was under the guidance of Ruth Rogers and Rose Gray at The River Café where she learned to appreciate the beauty and simplicity of food. Before moving to New York, April spent the summer of 2003 in Berkeley, California at the legendary Chez Panisse. In February 2004, April and restaurateur Ken Friedman opened New York City’s first gastropub, The Spotted Pig. Under April's direction, The Spotted Pig has earned one star from the Michelin Guide for six consecutive years, and since 2010, April & Ken’s The Breslin Bar & Dining Room also earned a star in the esteemed guidebook. 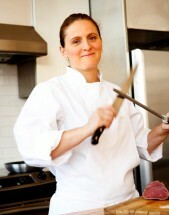 A Food & Wine “Best New Chef,” April continues to receive widespread attention for her food. In fall 2010, she and Ken opened The John Dory Oyster Bar, which joined The Breslin at New York’s Ace Hotel and earned a glowing, two-star review from the New York Times. April’s first cookbook, A Girl and Her Pig, was published by Ecco in April 2012.